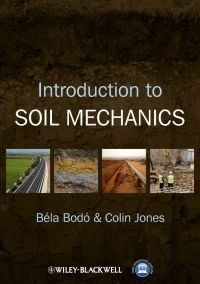 Introduction to Soil Mechanics covers the basic principles of soil mechanics, illustrating why the properties of soil are important, the techniques used to understand and characterise soil behaviour and how that knowledge is then applied in construction. The authors have endeavoured to define and discuss the principles and concepts concisely, providing clear, detailed explanations, and a well-illustrated text with diagrams, charts, graphs and tables. With many practical, worked examples and end-of-chapter and coverage of Eurocode 7, Introduction to Soil Mechanics will be an ideal starting point for the study of soil mechanics and geotechnical engineering. Béla Bodó B.Sc., B.A., C.Eng., M.I.C.E, was born in Hungary and studied at Budapest Technical University, the University of London and the Open University. He developed his expertise in Soil Mechanics during his employment with British Rail and British Coal. Colin Jones B.Sc, C. Eng., M.I.C.E, P.G.C.E, studied at the University of Dundee, and worked at British Coal where he and Béla were colleagues. He has recently retired from the University of Wales, Newport where he was Programme Director for the Civil Engineering provision, specializing in Soil Mechanics and Geotechnics.